Two brothers allegedly advertise and sell pricey but bogus training packages to people looking to make quick money on Amazon, according to lawsuits filed Friday. A Massachusetts-based company claiming affiliation with Amazon allegedly dupes people into paying tens of thousands of dollars for training seminars and products and promises "unrealistic profits they will earn as Amazon sellers," according to a lawsuit filed by the e-commerce behemoth on Friday. FBA Stores, and its cofounders Chris and Adam Bowser, lure Amazon sellers to pricey seminars by claiming to offer inside information about Amazon's systems, promising students an edge over competitors on the e-commerce marketplace, according to the lawsuit filed with the US District Court for the Western District of Washington. They use Amazon's logo on marketing materials. Even "FBA," which in this case stands for "Fulfillment by Adam," mirrors the standard initials used for "Fulfillment by Amazon." But Amazon says the Bowser brothers have no affiliation with the company or inside information. Instead, they mislead consumers about Amazon's selling policies, leading to fledgling Amazon storefronts that are suspended for violating the company's terms and conditions. For instance, FBA Stores teaches people how to open multiple seller accounts and to manipulate customer reviews in violation of Amazon's seller policies, according to the lawsuit. They also sell victims "overpriced, mislabeled and/or counterfeit" products to sell on the marketplace. When the sellers complain to FBA Stores, the Bowsers refuse to refund their money, Amazon adds. "Christopher and Adam Bowser are con-artists who prey on people hoping to become sellers on Amazon.com," the company claims. "The Bowsers’ scheme has been disturbingly successful and has already harmed hundreds or even thousands of would-be entrepreneurs. It has also harmed Amazon and its trust and goodwill with customers, as many of the Bowsers’ victims continue to believe that Amazon is somehow affiliated with, or approves of, this scam." The company is seeking damages and injunctive relief. FBA Stores did not immediately respond to BuzzFeed News' request for comment. In a separate lawsuit filed on Friday in a Washington state Superior Court, the Washington attorney general claims the scheme amounts to a violation of Washington's consumer protection and business opportunity laws. FBA Stores has has offered trainings in at least eight cities in Washington this year with potentially thousands of residents receiving advertisements for their trainings or attending the seminars, the office said in a statement. People are required to pay at least $995 before they are even allowed to read their contract with FBA Stores. The office said it aggressively sells additional trainings that range in price from $1,000 to $35,000. When sellers are booted off Amazon's third-party marketplace, they aren't refunded for the misleading advice, Amazon alleges. Amazon said in a statement to BuzzFeed News: "Amazon has zero tolerance for fraud. Amazon is investing heavily in protecting the integrity of the Amazon marketplace for consumers and sellers. Among other measures, we take independent legal action against bad actors, and we will continue to do so." Chris and Adam Bowser claim to have 17 years of experience selling products on the internet through sites like Amazon and eBay, according to the company's website. "I want to stress to you that I’ve never been 'the internet guy,'" Chris Bowser writes in the company's About section. "Adam and I started selling things we had lying around our house on eBay because we needed the money! We started selling old pairs of shoes, old clothes, old baseball equipment…and from there it just grew. Before we knew it, we were buying products at discount and then reselling them on eBay & Amazon for huge profits." During a webinar described by the Washington attorney general's office, Chris Bowser claims he and Adam Bowser made more than $75 million in online sales in 18 years of business, $12 million of which was through Amazon in just one year, and that they both have done more than $1 million in sales on Amazon in the last 30 days. "We have reached a point in our business where there is no way we can sell enough product for the demand that exists on Amazon alone!" Chris Bowser writes on the company's website. 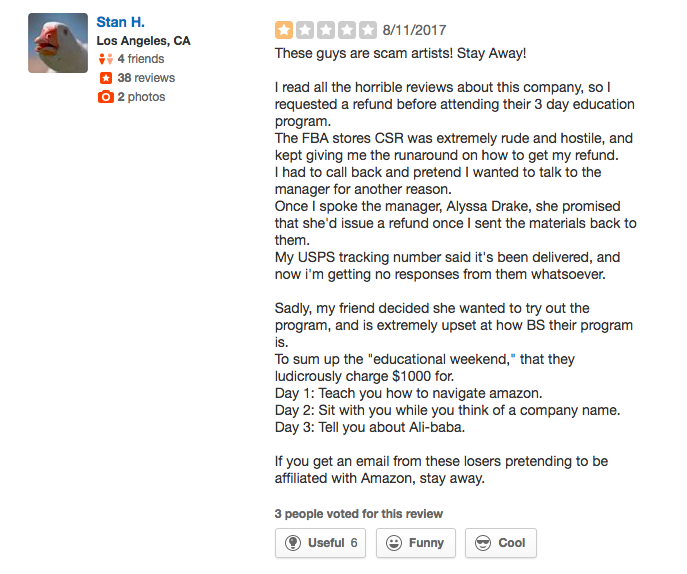 Consumers have called the Bowsers "scam artists" on Yelp and have warned others to "stay away from this horrible company" on the Better Business Bureau's website, where it has an F rating. "They sent me FAKE products!" reads one Yelp comment made in November. "The owner of the products threatened to sue me because I had fake products on my site that were provided by Fulfillment by Adam. Amazon almost blackballed me. 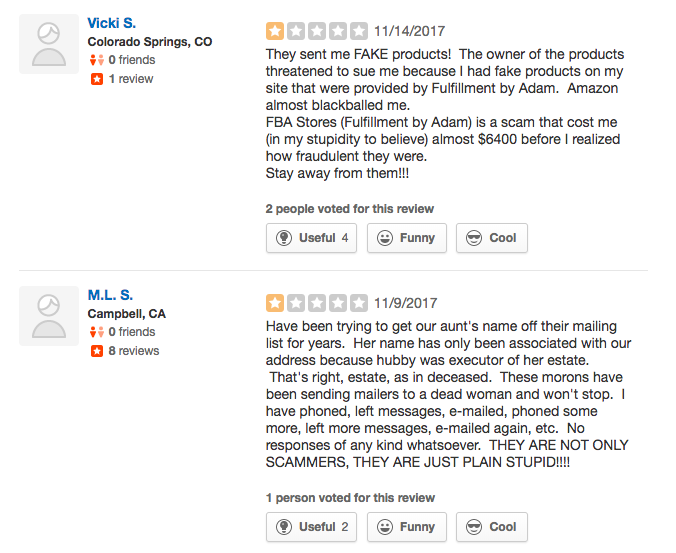 FBA Stores (Fulfillment by Adam) is a scam that cost me (in my stupidity to believe) almost $6400 before I realized how fraudulent they were. Stay away from them!!!" A complaint filed with the Better Business Bureau in July calls the company "a nightmare." "All they do is make false promises and do not follow through with any complaint," the victim adds. "This business has cost me tens of thousands of dollars and the storage fees and lack of profit from selling is enormous. Do not fall prey to this business as they are just looking to make a profit off of their students."